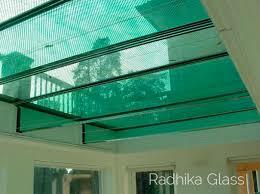 GREEN Laminated glass 1/4″ used in Tractors, skylights, trucks, equipment etc. Two pcs of glass with a plastic layer in-between. This is a safety glass. Plastic layer holds glass together if broken.